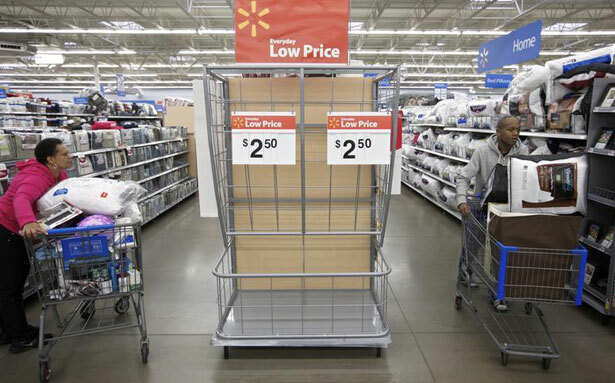 While Walmart rakes in annual profits of more than one billion dollars, the average hourly wage of a Walmart sales associate, according to a report by IBISWorld, is just $8.81. That translates to an annual salary of $15,575, far below the federal poverty level for a family of four. On top of being unjust, Walmart’s low wages come at a high price for American taxpayers: a recent report revealed that, because the retail giant's employees are forced to utilize government benefits to supplement their meager income, a single Walmart Supercenter could cost taxpayers from $900,000 to $1.7 million per year. In the face of this, Walmart workers are fighting back: workers recently launched a historic prolonged strike against the company and traveled from around the country and world to Walmart headquarters to demonstrate at the retail giant's annual shareholders' meeting. As the largest private employer in the nation, Walmart must be held accountable. Sign our open letter to company CEO Mike Duke and the Walmart Board of Directors demand that Walmart give its workers a raise. Editor's Note: To discuss Walmart's statement regarding The Nation's internship program, head to our response here. By signing this petition, you will receive periodic updates on articles, events and actions from The Nation magazine. You may unsubscribe at any time.